FibroBoost® contains Seanol®, a unique polyphenol complex from brown algae (Ecklonia cava). Seanol is produced using a patented extraction process that creates a complex of ten sea-based polyphenols. Widely studied for their health benefits, polyphenols are a diverse class of naturally occurring compounds found abundantly in the vegetable kingdom. Polyphenols from land growing plants are largely water soluble, breaking down rapidly in the body when consumed in food. In contrast, Seanol polyphenols are hydrophobic (repelled by water and therefore non-water-soluble); this allows them to remain in the body for up to twelve hours before being metabolized and excreted, greatly enhancing their beneficial health effects. Seanol meets stringent specifications for purity, upper limits on microbial contamination and levels of heavy metals (lead, mercury, cadmium, arsenic). Each lot is tested for conformance to specifications and accompanied by a Certificate of Analysis showing the test results and laboratory methods utilized. More than thirty million dollars has been invested in the research and development of Seanol. Safety and efficacy have been confirmed in an array of scientific tests that includes in-vitro and in-vivo studies, animal studies and human clinical trials. Seanol has beneficial effects on mental energy and acuity, as demonstrated in randomized, placebo-controlled studies (unpublished). Results include improvements in cerebral circulation, optimized ratios of alpha to beta brain waves and increases in parasympathetic activity. In another set of studies, students and professional drivers taking Seanol experienced less drowsiness when studying and driving.4 Seanol raises levels of acetylcholine, one of the bodys major neurotransmitters that control memory and cognition. Kang K, Park Y, Hwang HY, et al. Antioxidant properties of brown algae polyphenolics and their perspectives as chemoprotective agents against cardiovascular risk factors. Arch Pharm Res 2003;26(4): 286-93. Jang, Y Effect of Mo bar on hemopoiesis, endothial function, endocrinological profile and daily activities in adults. November 2001. Cardiology Division, College of Medicine, Yonsei University, Seoul, Korea. Hong J-H, Son B-S, Kim B-K, et al. 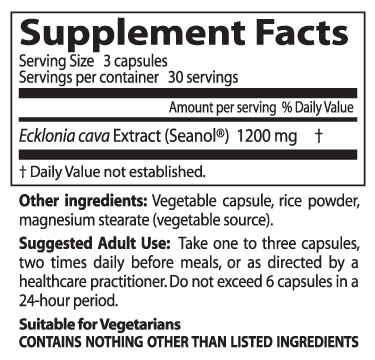 Antihypertensive effect of Ecklonia cava extract. Korean Journal of Phamacognosy 2006;37(3):200-205. Shin H-C. Summary of SEANOL-based beverage metrics. June 2006; LiveChem Inc., Seoul, Korea. Shin H-C, Hwang KJ, Kang BH, Lee BH. An antioxidative and anti-inflammatory agent for potential treatment of osteoarthritis from Ecklonia cava. Arch Pharm Res 2006;29(2):165-71. Chi E. The beneficial effects of feeding SEANOL-based drink X2 in a fat mouse model study. 2004; Department of Pathology, University of Washington, Seattle. Shin H-C. SEANOL-obesity/DGAT Research Notes. LiveChem Inc., Seoul, Korea. Shin H-C. Evaluation of Toxicity of Seanol. June 2007; LiveChem Inc., Seoul, Korea.